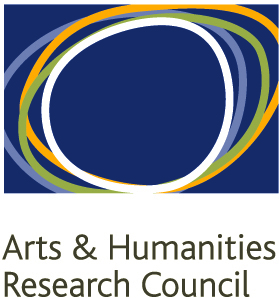 I have a number of small surveys which remain unreported that I need to catch-up on, and so here is the first of them. 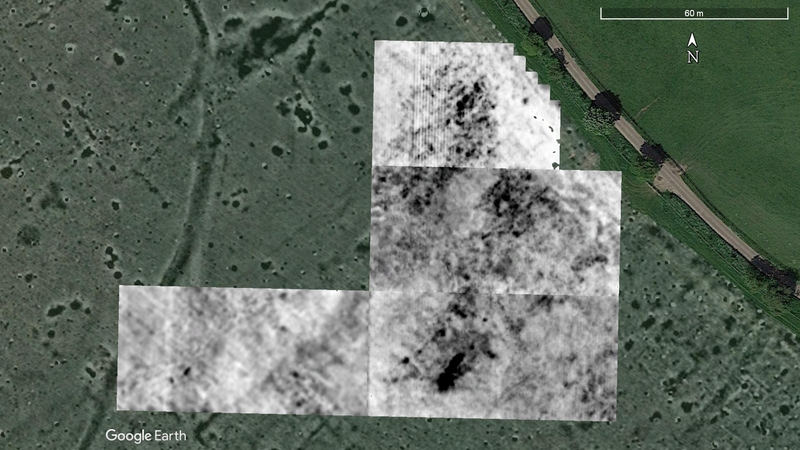 Earlier in the year, Mike Smith and I assisted Alex Thomas (University of Bristol) in undertaking a Ground Penetrating Radar survey of land lying to the north of the B653 at Batford, Harpenden, Hertfordshire (TL 148150, Fig. 1). 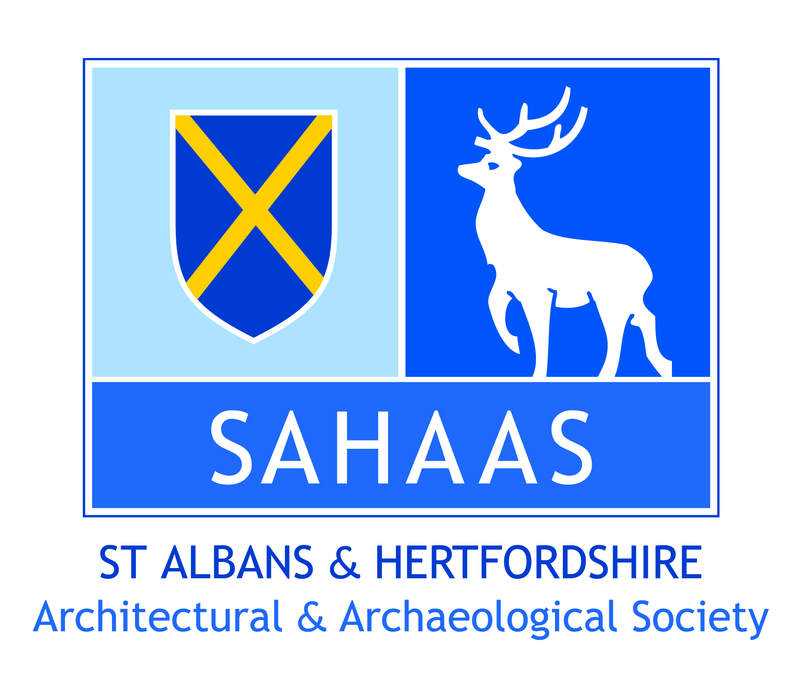 The survey was undertaken over the weekend of 2nd/3rd April 2016. 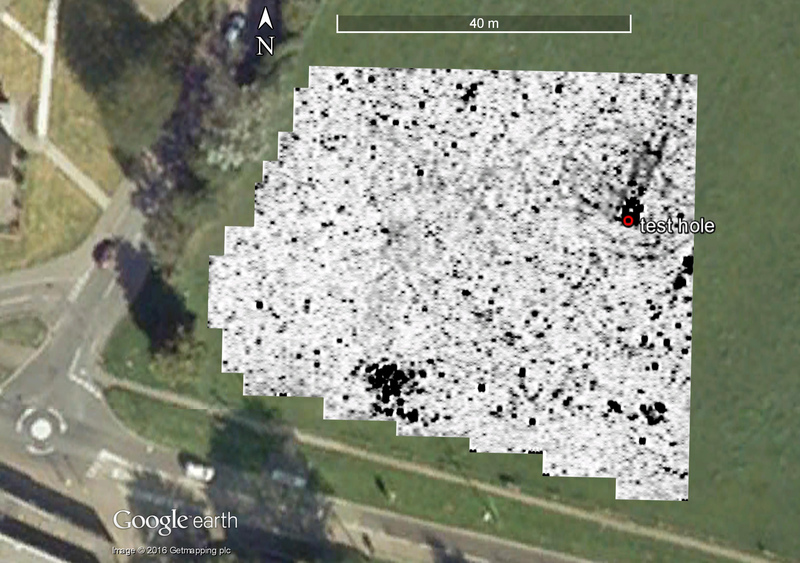 Earth resistance and magnetometry surveys had been undertaken in the area previously. Fig. 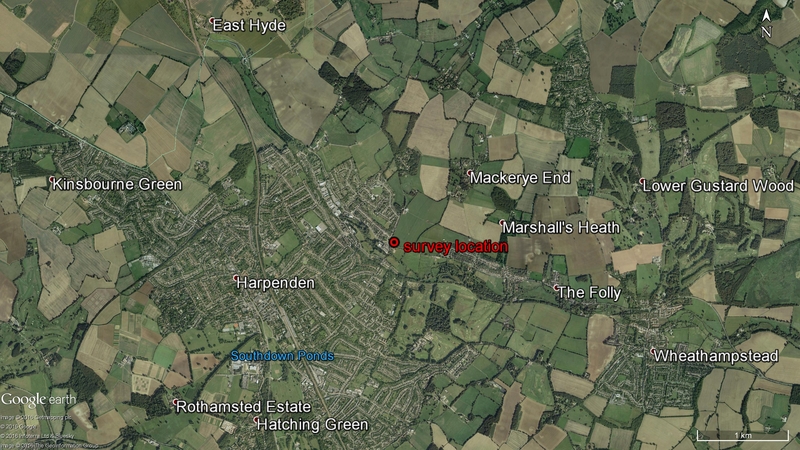 1: Location of the site at Batford. The underlying geology of the site is Lewes Nodular Chalk formation overlain in places by the Kesgrave Catchment Subgroup sand and gravel. A Mala GPR with a 450mhz antenna was used, identical to the one CAGG borrow from SEAHA. 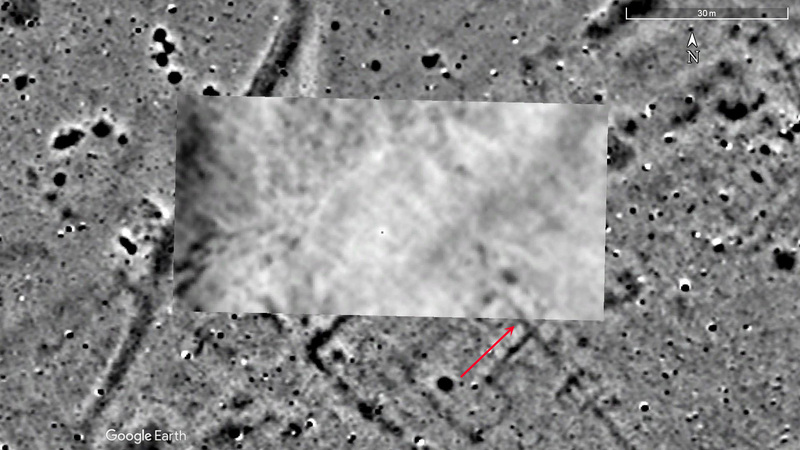 The survey transects were at a 0.5m spacing collected in a zig-zag fashion. The survey started in the NE corner and proceeded east-west. Radar pulses were set for 0.05m intervals with a time-window of 73ns. The newer Mala systems do not allow manual selection of sample numbers which are determined by the machine, in this case 376 samples per trace. For the amplitude slices presented here, as usual, the software system developed by Jeff Lucius and Larry Conyers was used (http://www.gpr-archaeology.com/software/). This necessitates the conversion of the Mala rd3 files into GSSI dzt files using the companion conversion program. For this posting, the slices were 3ns in thickness starting at 3.5ns From these, it appears that the second slice, 6.5–9.5ns represents the immediate ground surface. This agrees with the estimate of the first reflection from the individual radargrams at about 8ns as examined using RadExplorer. Beyond slice 7 (>24.5ns) the signal has completely attenuated. This means that all the usable returns lie in the band between c.6.5 and 24.5ns. This is not unusual for Hertfordshire where the clay soils do not allow for the GPR surveys to penetrate particularly deeply. 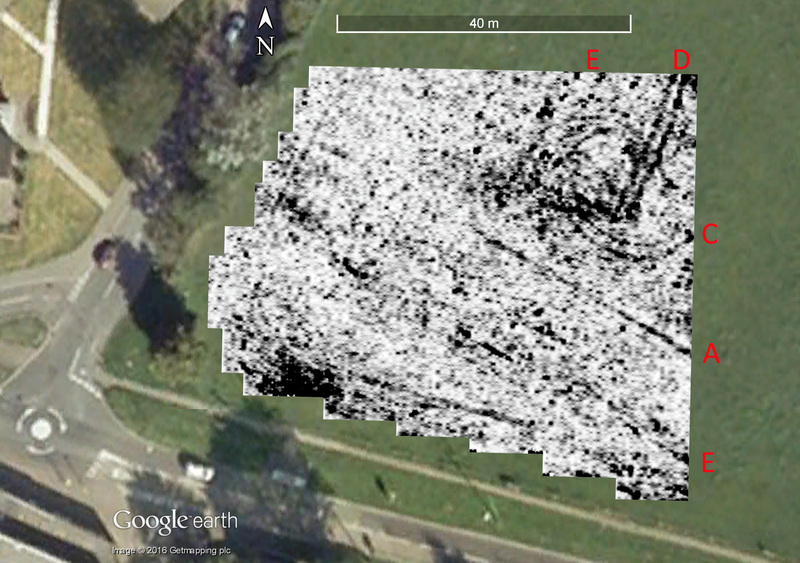 As with most of the GPR surveys reported in this blog, the numerical output from that software was turned into images using Surfer v.8. 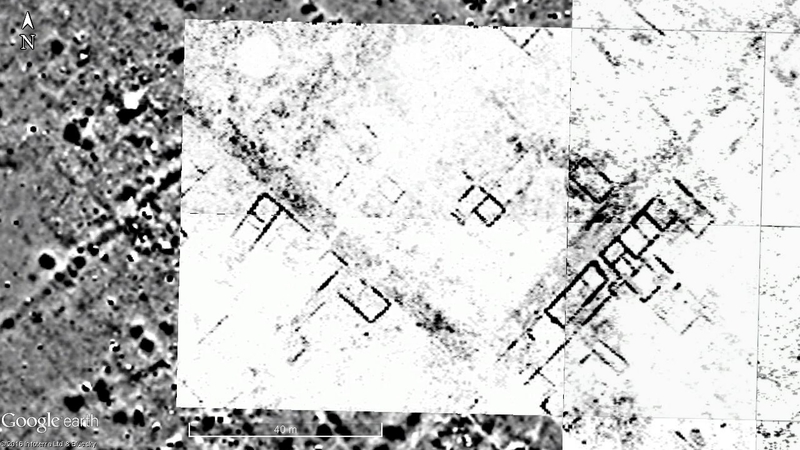 Kriging was used to interpolate the values into a 0.1 x 0.1m grid. 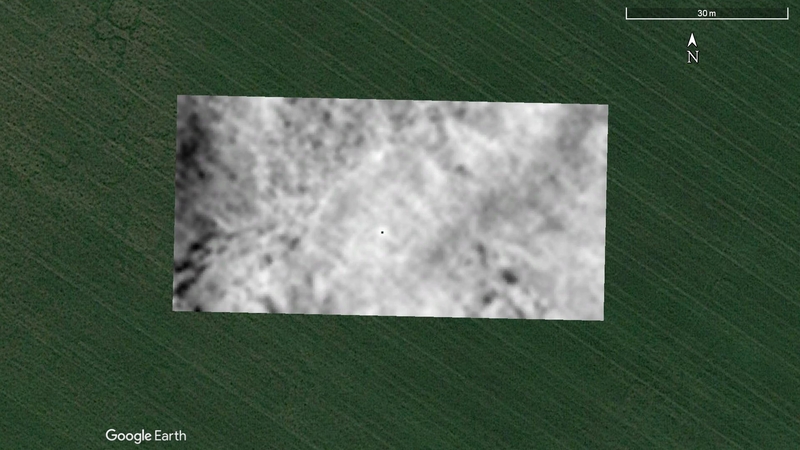 The resulting images where then imported into Google Earth. 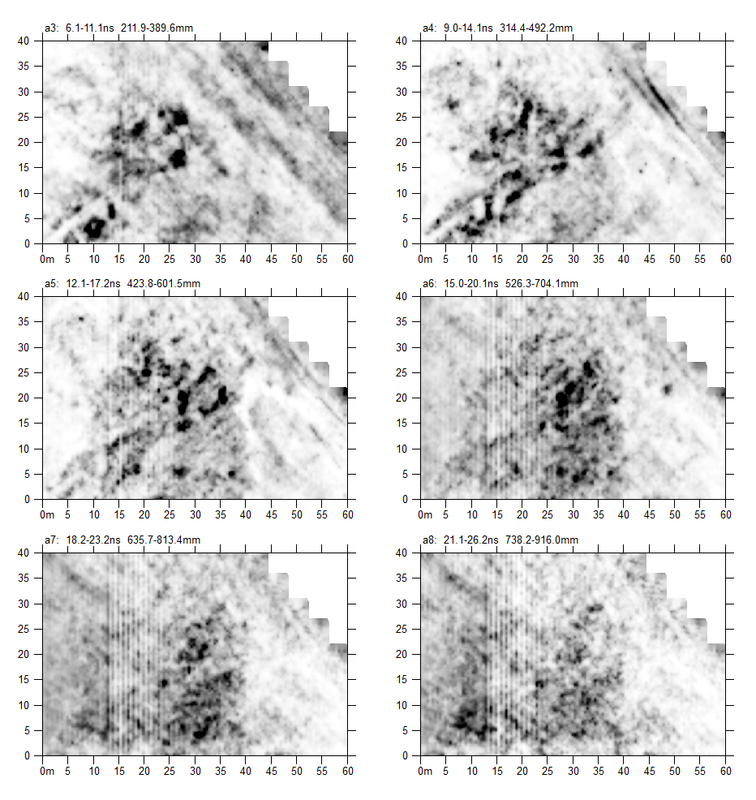 Six amplitude maps or `time slice’ maps were produced and are shown in Figures 2–7. The topmost map (Fig. 2) shows two strong reflections to the north-east and the south. 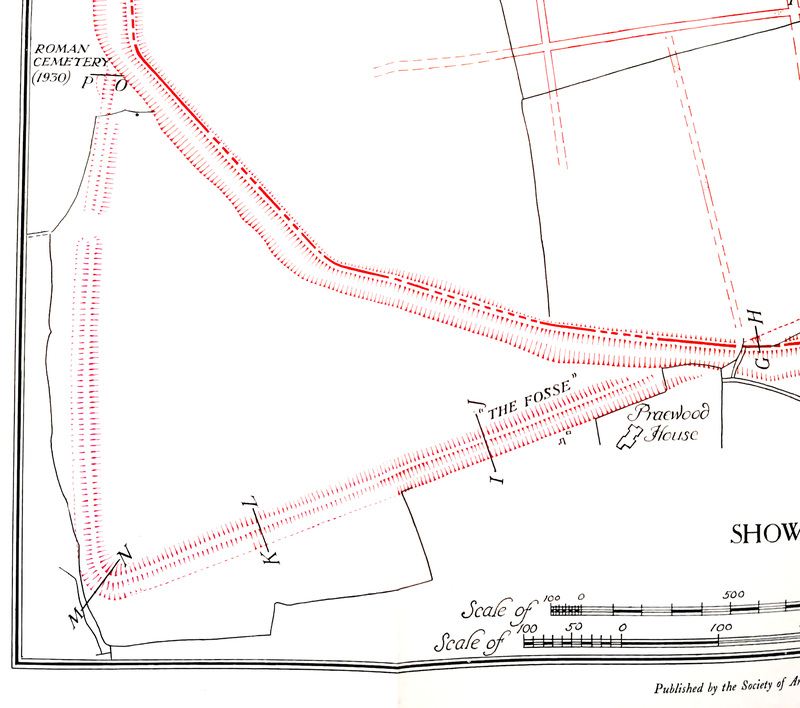 The second map (Fig. 3), which represents the 9.5–12.5ns range, has the clearest set of features. A number of long linear features are visible, two of which I have labelled A and B. There is a odd-looking curved linear feature with two parallel lines, labelled C, into which a pair of parallel lines cuts, labelled D. Further fainter linear features can be seen, such as those at E.
Fig. 2: Time slice 2 (6.5–9.5ns). Fig. 3: Time slice 3 (9.5–12.5ns). The third map (Fig. 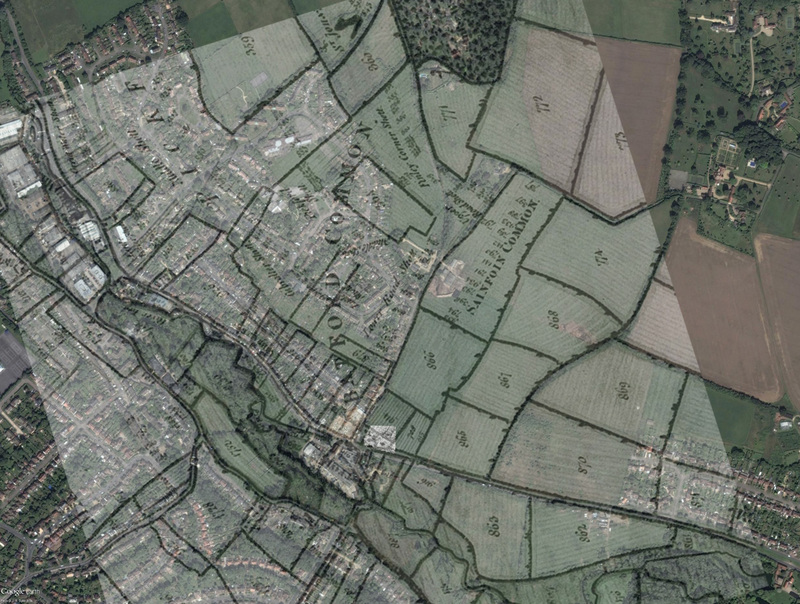 4) has fewer clear features, most of which are probably `echoes’ of the features seen in the previous map. The next three maps (Figs. 5–7) have successively fewer features in them, none of which are especially clear. By the last map, the GPR signal has largely attenuated and little can be seen. At best, we are getting a depth penetration of about a meter, probably somewhat less. Fig. 4: Time slice 4 (12.5–15.5ns). Fig. 5: Time slice 5 (15.5–18.5ns). Fig. 6: Time slice 6 (18.5–21.5ns). Fig. 7: Time slice 7 (21.5–24.5ns). The question arises, therefore, as to what the long linear features may be. If Fig. 3A is a wall, it would be at least 35m long, and Fig. 3B would be at least 55m long. One possibility is that they represent old field boundaries. 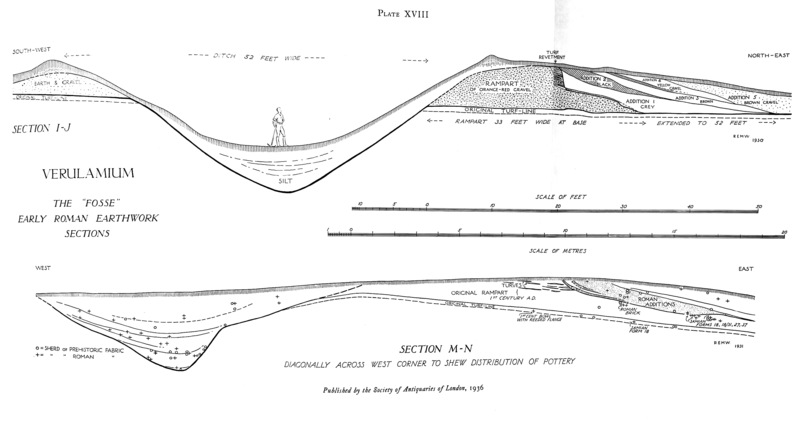 Looking at the 1898 OS map (Fig. 8), there is nothing to suggest an origin for those features. 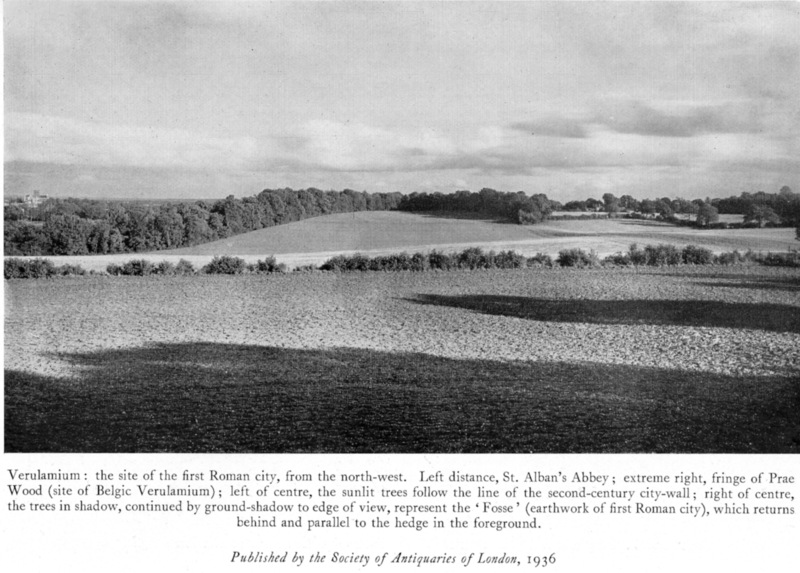 The 1799, map now in the Westminster Abbey Muniments Room does, however, show a field boundary behind some buildings to the north of the road. A crude overlay of an extract of this map (Fig. 9) on the Google Earth image with the GPR data, shows a remarkably good correlation between the field boundary and the one of the linear features (Fig. 3A). 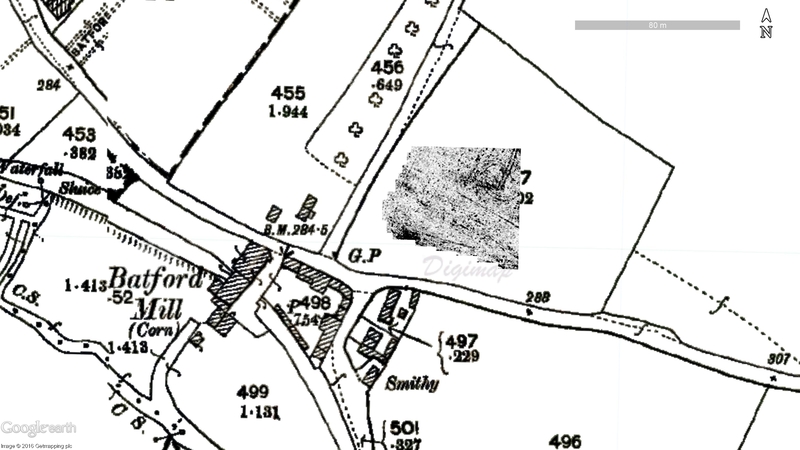 Fig 8: The survey overlain on the 1898 OS map. Fig. 9: The 1799 Westminster Abbey map overlain on the Google Earth image. 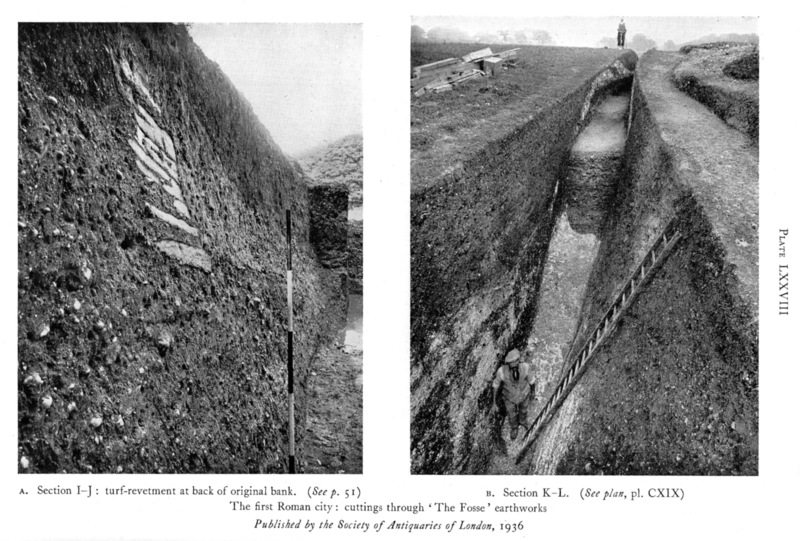 The origins of the curved and parallel linear features can be seen if one takes into account the location of the machine-dug test trench marked in Figure 10. These parallel lines, only some 1.8m apart, represent areas of soil compression from the machine used in the excavation of the test trench. 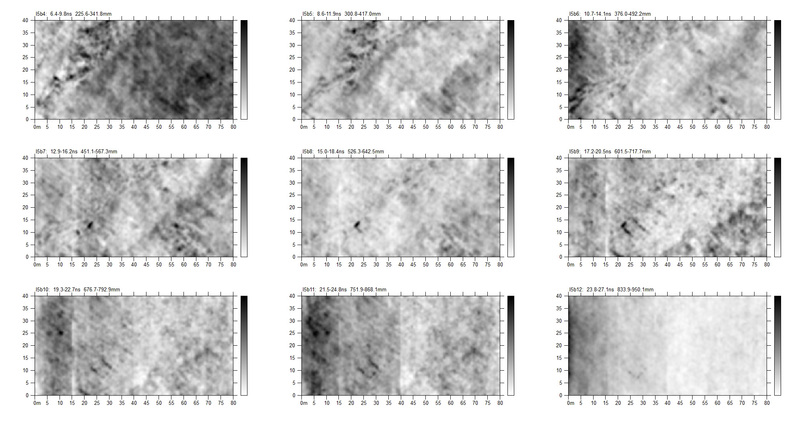 Examination of one of the radargrams (Fig. 11) would seem to confirm this. The origin of the reflections, marked with blue arrows, occurs at the very surface and is highly suggestive of compression rather than construction. Fig. 10. Slice 2 showing the location of the machine dug test hole. Fig. 11: Radargram showing areas of surface compression. 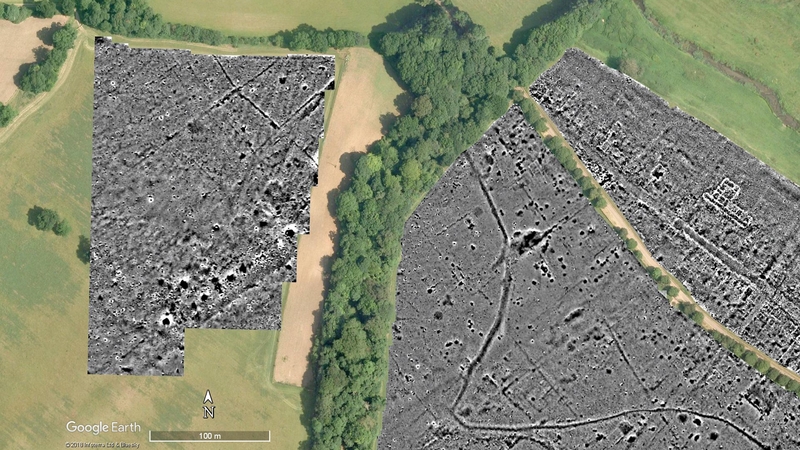 The survey results appear to be largely connected to (a) earlier agricultural use of the land in the form of hedgerows and so forth or (b) the recent impact of the excavation of the test trench. It appears highly unlikely the GPR results indicate any sort of structure although the golden rule of ‘absence of evidence is not evidence of absence’ must be applied. 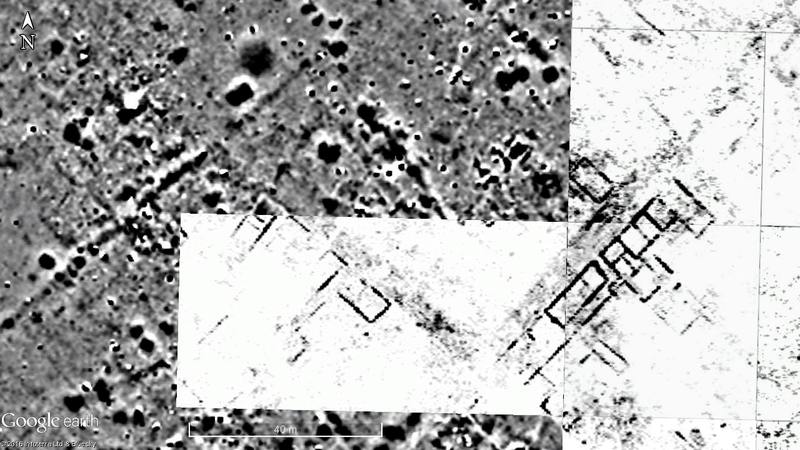 The lack of pottery or ceramic building materials on the surface makes it unlikely that a building is indicated. Perhaps I should have saved a more exciting post for #100! 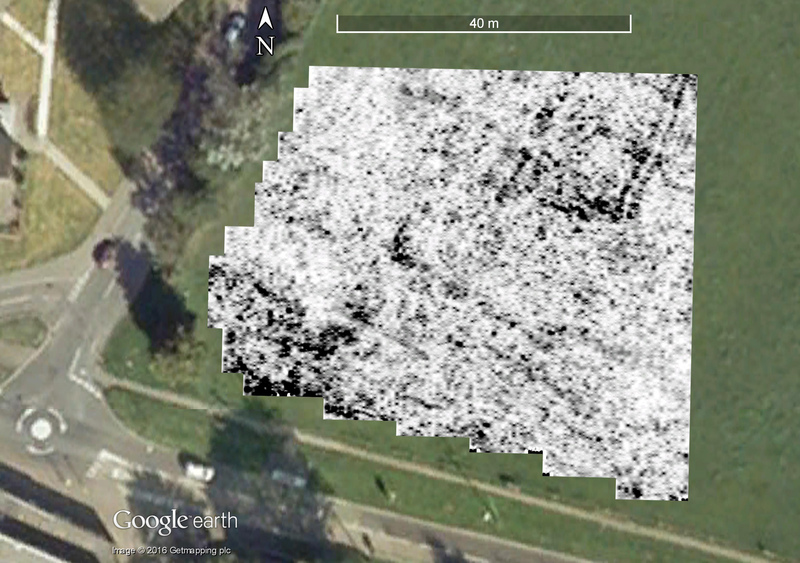 This entry was posted in Batford and tagged Batford, CAGG, geophysics, GPR, Hertfordshire, old maps, survey, time slices, Westminster Abbey on October 19, 2016 by hertsgeosurvey. 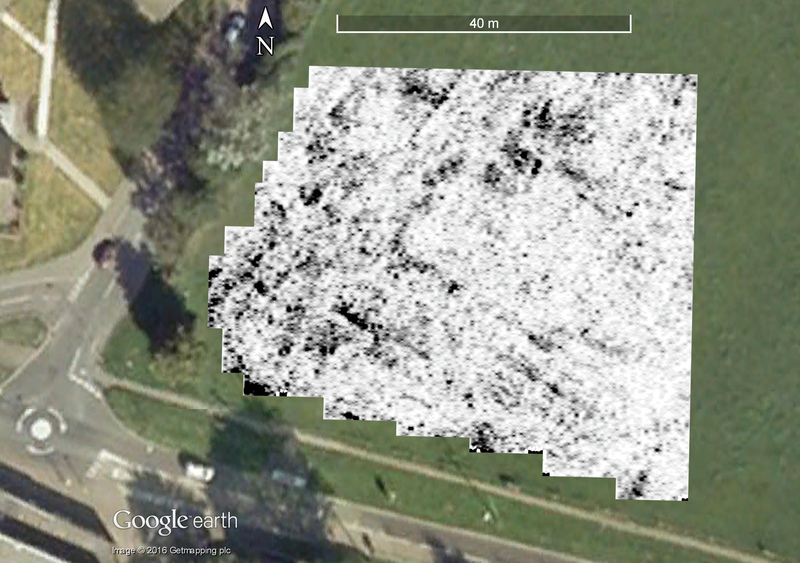 Just a quick posting this evening to show the GPR and earth resistance survey results. Firstly the GPR. We completed another 80x40m block, shown here as the upper block in the centre of the image. The GPR survey after day 21 (slice 4). The lighter grey band running NW-SE across yesterday’s and today’s blocks is a road. Either side of the road we can see the foundations of buildings. They are a little scrappy, but they are clearly there. What is really peculiar is the large round white feature, i.e., one with no reflections, in the top-left corner. If we compare this to the mag survey we can see there is a large magnetic anomaly (shown as a dark, roughly circular, blob) in the same place. 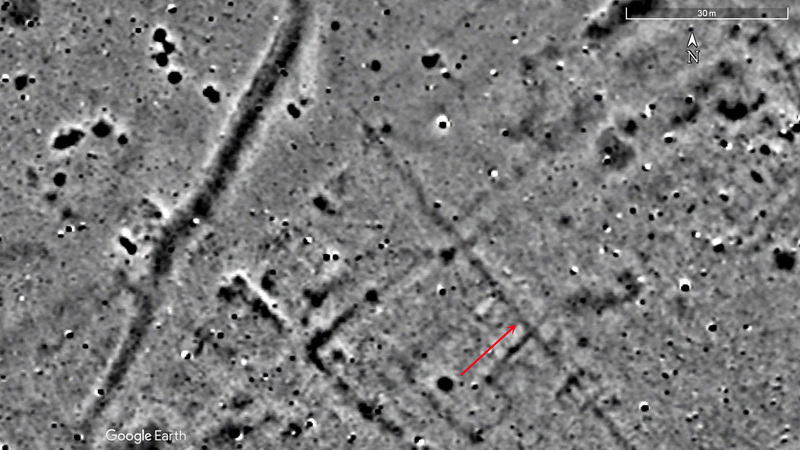 The same area as the above image showing the mag data in the block surveyed by the GPR on day 21. Cuiriously, the round “blob” shows in the GPR data but the very strongly magnetic rectangular feature just to the south does not. One can just make out the SW-NE running ditch in both surveys. I have no idea what the large round feature is, but it is very large. The team running the earth resistance meter did a sterling job completing five 20x20m squares. The earth resistance survey after day 21. As can be seen, the road in the SE corner is showing up very clearly. Why is it so vague further to the NW? I guess is may have been robbed. 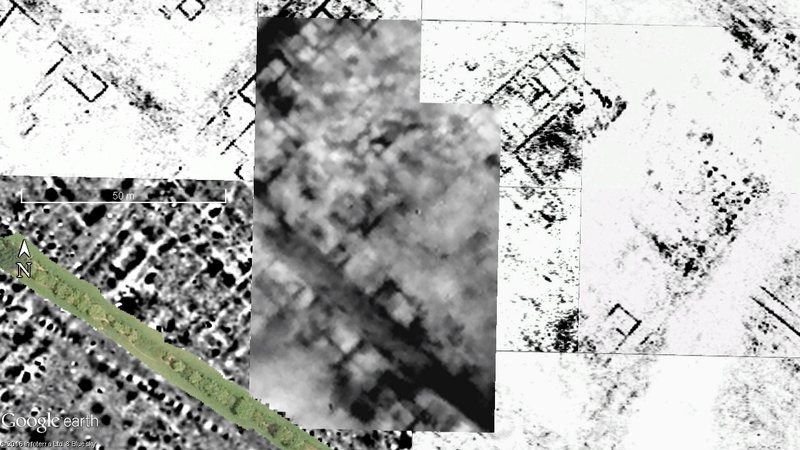 In the top-rightmost square we are starting to pick-up the walls of the large complex building revealed by the GPR. Tomorrow the GPR will do another block to the north, and the resistance meter will continue working eastwards. As always, thanks to everyone who helped today. More tomorrow. 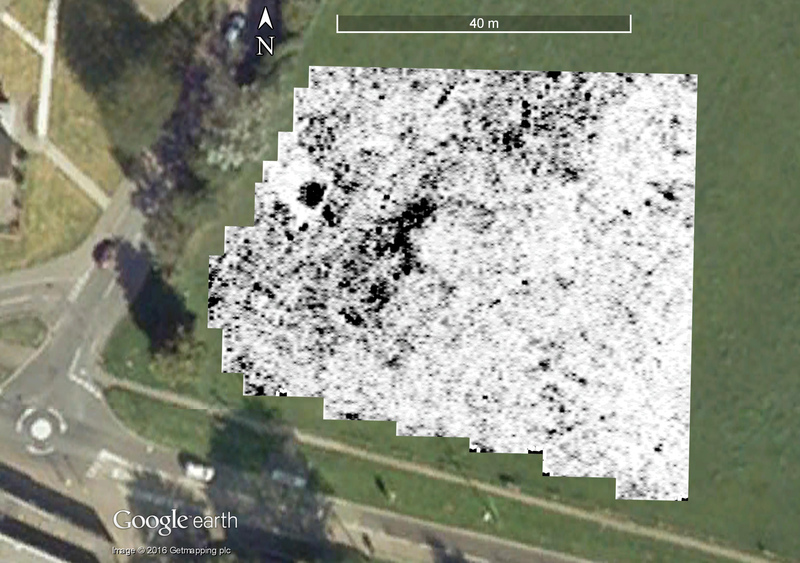 This entry was posted in Verulamium and tagged CAGG, city, earth resistance survey, GPR, Ground Penetrating Radar, magnetometry, Roman, survey, urban, Verulamium on August 5, 2016 by hertsgeosurvey. After the cold and rain of the previous day’s survey, today was a scorcher! 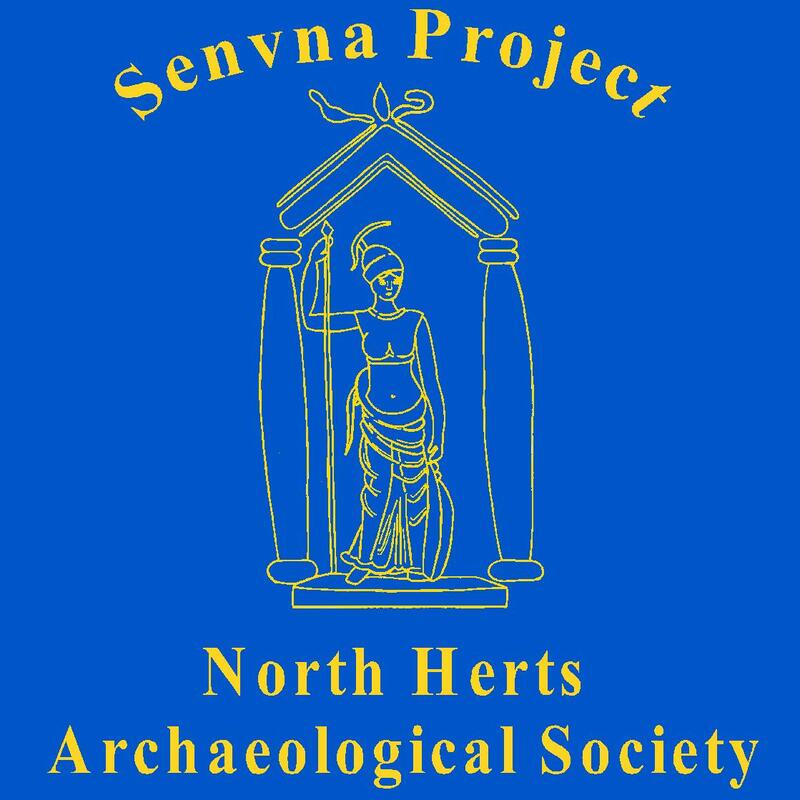 Burcu Urundul (Welwyn Archaeological Society), John Dent (St Albans and Herts Archaeological and Architectural Society) and Ralph Potter (West Essex Archaeological Group) were out today continuing our survey in Verulamium Park. 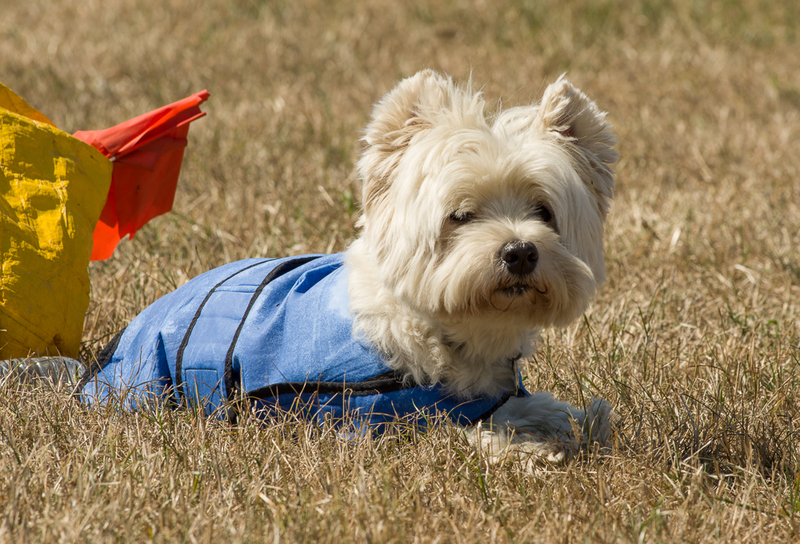 There was a minor hiccup at the start of the day when a toddler wandered off with the pin flag we were using as a backsight for the Total Station! 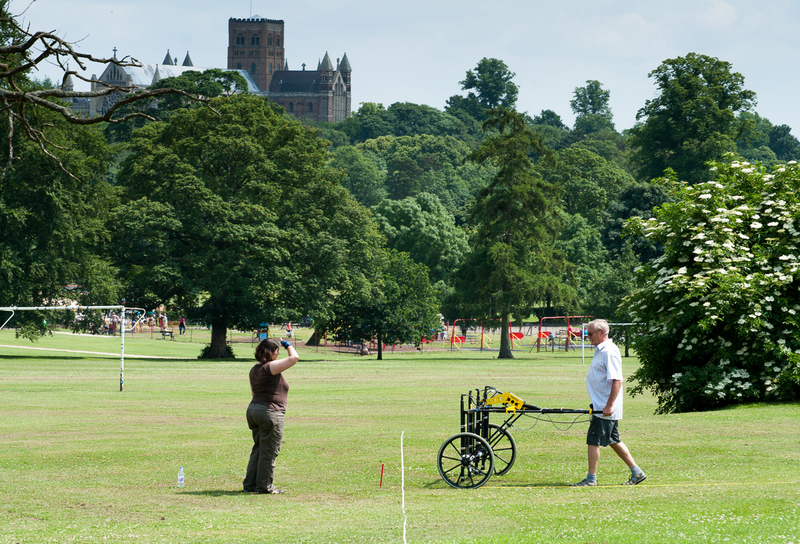 Burcu and John surveying in the park. 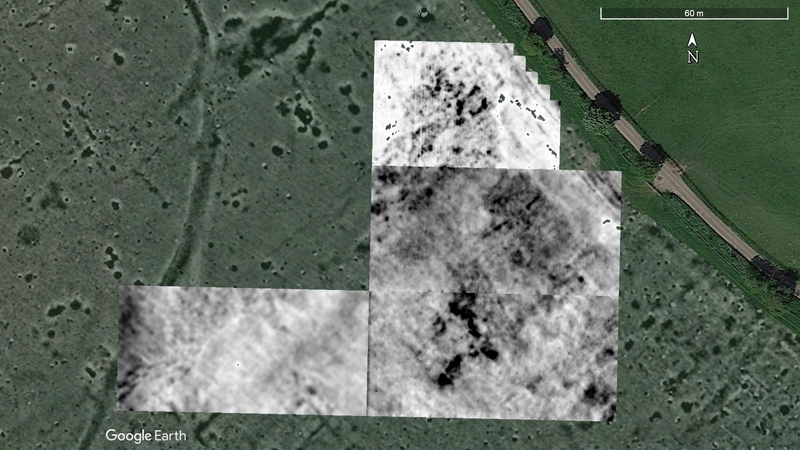 We did, however, manage to survey another five 40 x 40m grids. The results are posted below and are very interesting. 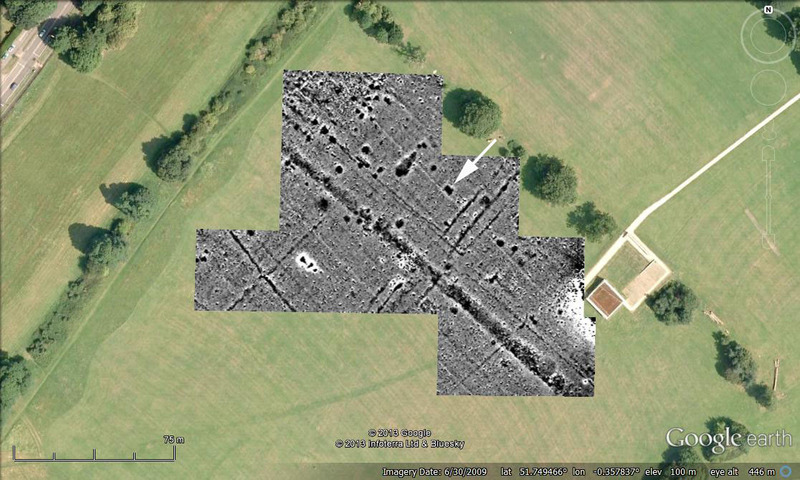 The ‘1955’ ditch clearly shows across the plot, and there are a number of ditches and linear features. One feature that catches my eye is the rectangular one indicated by the white arrow. It is about 4.5m long and 2.75m wide and is quite strongly magnetic at about 12 to 20 nT, but not so much so as to be metallic. Very curious indeed. 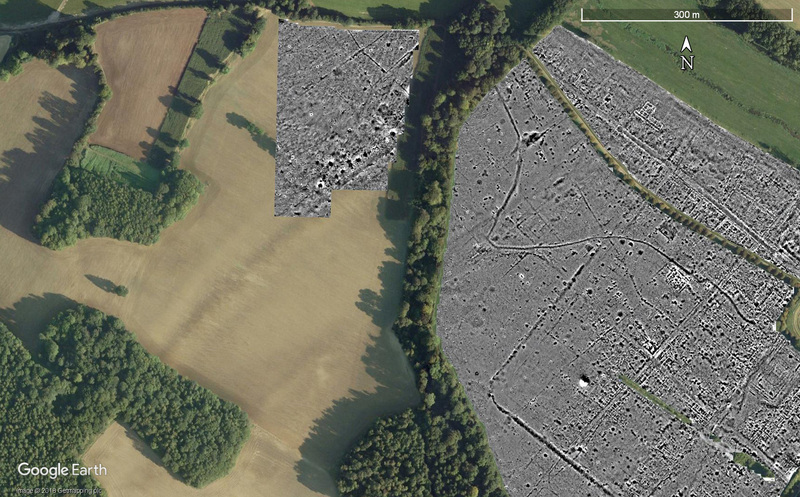 It is also interesting to see that there appears to be more activity inside the ‘1955’ ditch (to the NE of the plot) than outside it (to the SW). The results of the survey after the third day. Tomorrow sees us out for the last time before next weeks course. Wish us luck! 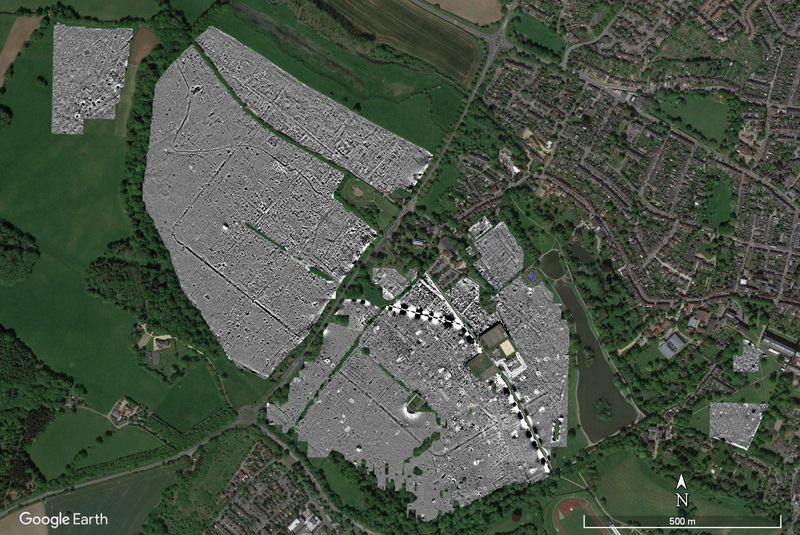 This entry was posted in Verulamium and tagged archaeology, Arts and Humanties Research Council, Hertfordshire, magnetometry, Roman, St Albans, survey, Total Station, Verulamium, Verulamium Park on July 5, 2013 by hertsgeosurvey.